Like everyone in Los Santos, you’ve got fond memories of the original Pfister Comet. Cruising through Vinewood with a bellyful of Bull Shark Testosterone dropping alpha sized one-liners about the size of your bonus... Picking up hitchhikers and passing them off as your fiancé at family gatherings or losing the LSPD in a straight line along the main drag. This race-tuned bullet is built for only one thing: to make everyone else look like the asthmatic kid in gym class. 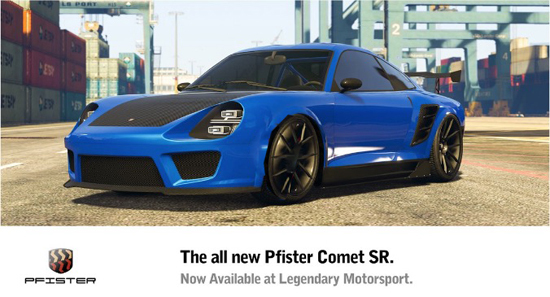 Pick up the Pfister Comet SR sports car at Legendary Motorsport today. If you logged into GTA Online between February 16th and 26th, be on the lookout for your 2018 San Andreas State Tax Refund of GTA$250,000 and 10% rebate up to GTA$1M hitting your Maze Bank account before March 6th. Air Quota – Work your way through every flavor of airborne combat the Los Santos skies have to offer the only way you know how - by blowing your opponents to bits with Missiles and Cannons. Rockstar-Created Transform Races – Compete across air, land, sea or foam in all 32 Rockstar-Created Transform Races - where a Checkpoint can instantly find you at the controls of a different vehicle. Time to wave to all your friends at the FIB as you get some turbo-charged air time over their HQ. Strap in and compete in this week’s Premium Race, where the top three finishers earn GTA$ and all participants get Triple RP regardless of where they place. Launch Premium Races through the Quick Job App on your in-game phone or via the yellow corona at Legion Square. Nothing violates the tranquility of green hills or lonely desert roads as efficiently as competitive motorsport. Kill two birds with one time trial all the way from the Vinewood Bowl to Paleto Cove. To take a shot at this week's Time Trial, set a waypoint to the marker on your in-game map and enter via the purple corona. Beat par time and you'll be duly rewarded with GTA$ & RP.